Beach, 7-10 pm. 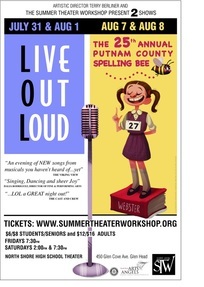 Summer Theater Workshop staging of The 25th Annual Putnam County Spelling Bee, North Shore HS Theater 7:30 pm, Sat. 2pm and 7:30 pm; Sat. 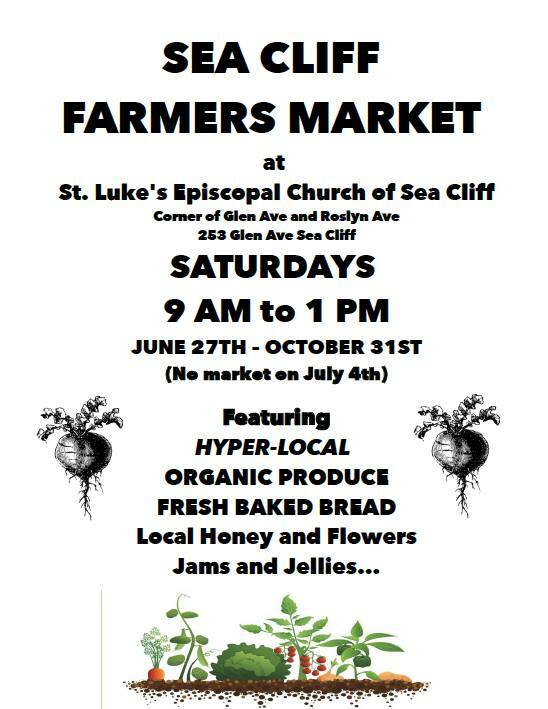 8/8 - Sea Cliff Farmers Market, St. Lukes, 9am-1pm. 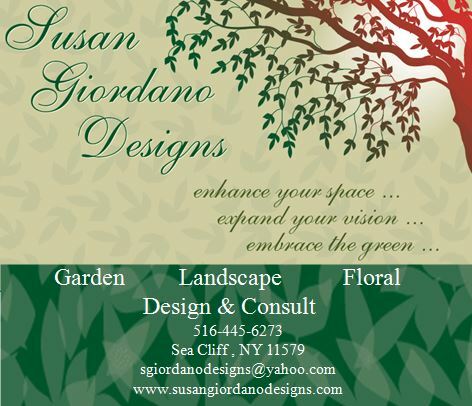 Before they allow RXR to build a single additional multiple-housing unit or apartment complex, accessible only by car, Glen Cove’s leaders would do well to take to heart some urban planning basics that best serve the entire Glen Cove community’s long-term interests—not just serve developers' short-term interests and provide politicians with quick fixes. August 2, 2015 -- On Sunday morning, an effigy of St. Rocco, the protector against plague and contagious diseases, was carried through the streets surrounding St. Rocco's Church in Glen Cove on the culminating day of the church's annual six day Feast. As the three hour procession mades its way through the neighborhood, devotees sang songs, recited prayers, attached monetary offerings to the statue, and visited the sick and home-bound where blessings were offered with a relic of the Saint. The festival, which began Tuesday, resumed later in the day and concluded that night. 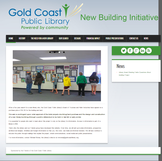 July 25, 2015 -- In an effort to keep residents up to to date and informed about the costs, design, background and process going forward as the community considers the proposed purchase of the 5.3 acre Halm Industries property on Glen Head road and the building of a new library at that site, the Gold Coast Library launched an informational website this past week. Click here or on the image above to access the website. Yes, that zany, preposterous golf event through the front and back lawns, hidden gardens, parks and passageways of the 132 year old Victorian village is back. The Association will use this delightfully wacky contest as their primary fundraiser for 2015. Taking place on Saturday, September 19, each participant will get true-flight practice balls, a map, a scorecard and will be assigned a hole to start. There are 24 par three holes for a par score of 72. A foursome is $100 or $25 per player. Anyone can walk the course without golfing for $10. Check-in time is 8:30am and tee-off will be 9:15am. 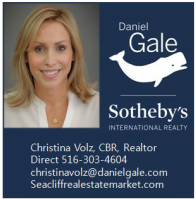 Pre-registration is available at the Daniel Gale Agency on Sea Cliff Avenue in Sea Cliff. 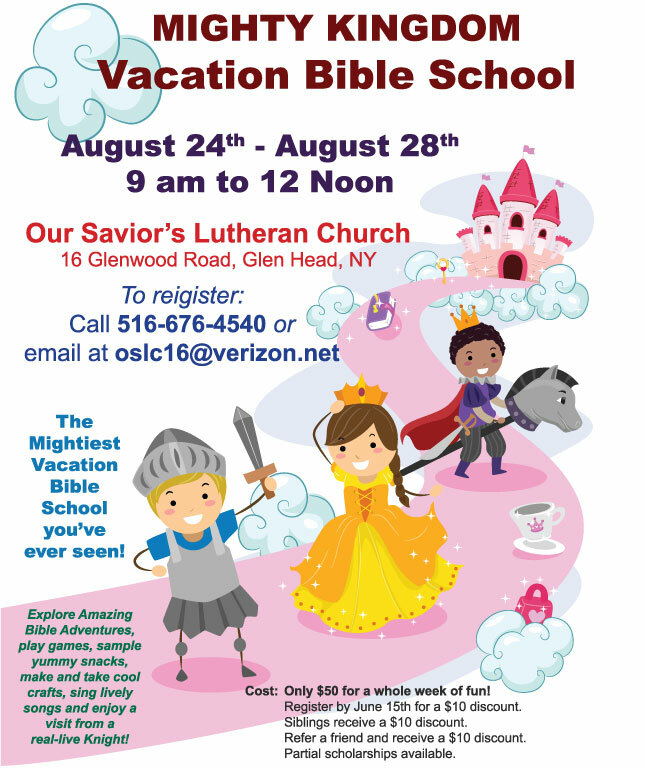 The Association is seeking sponsors for this fun event. You or your business can sponsor a hole for $100. Other sponsorship forms are available. 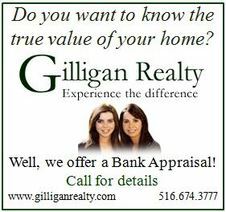 For information contact Sheila Wenger at sheilawenger@danielgale.com. CAN YOU HELP US FILL A CHILD'S BOOKBAG? 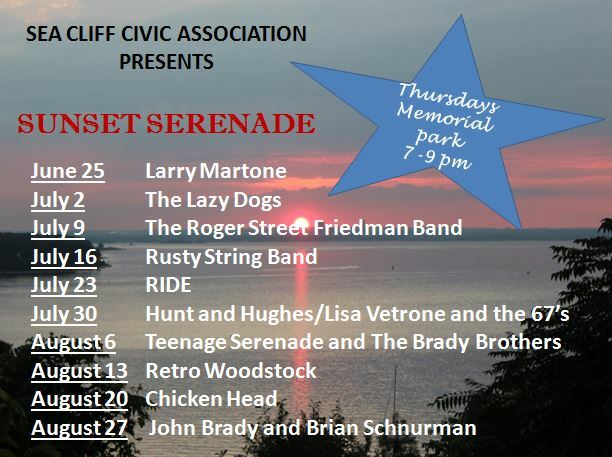 Although Sunset Serenade was washed out by heavy downpours this past Thursday afternoon, a quick change of venue allowed the show to go on as Hunt and Hughes moved their act to the front porch of Sea Cliff Civic Association President Ann DiPietro's home. 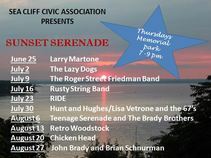 This upcoming week, its the Brady Brothers and Teen Serenade - a showcase of Sea Cliff's young school-age musical talent. 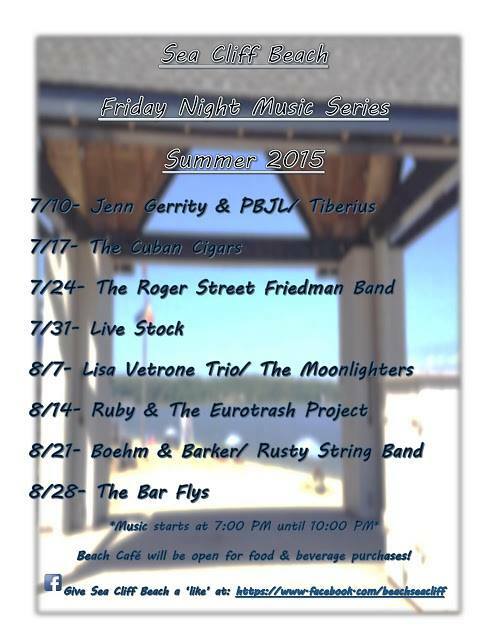 On Friday at the Beach, the Lisa Vetrone Trio will perform followed by Moonlighters. 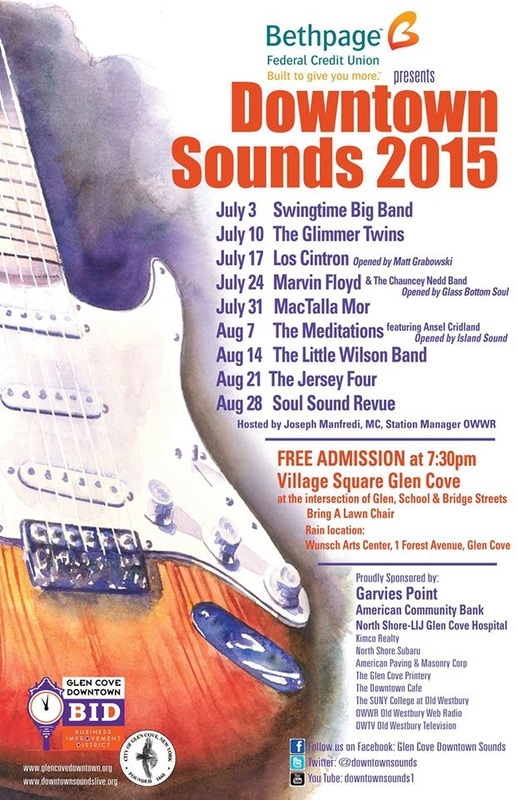 Back by popular demand, The Meditations featuring Ansel Cridland will perform during week six of the 2015 Downtown Sounds Concert Series at the Glen Cove Village Square Plaza on August 7 at 7:30 pm. 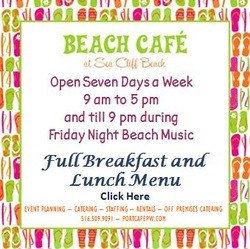 . .
Join Children's Librarian Ann DiPietro each Wednesday Morning at Sea Cliff beach for a story, song and Craft st Sea Cliff Beach 10:30 am through August 19. ﻿﻿Join Children's Librarian Ann DiPietro for a discussion of Roald Dahl's Esio Trot at the Sea Cliff Children's Library at 6 pm. 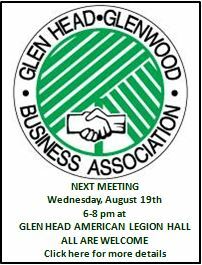 Pizza and Refreshments will be served. On Friday, August 7, Dennis Fleury of the Tackapausha Rescue Center will visit the Sea Cliff Children's Library to offer an animal workshop presentation. The Tackapausha Rescue Center provides interactive educational programs at schools and libraries around Nassau Country introducing children to different animal species, with the goal of promoting greater environmental awareness and scientific education. The Workshop will start at 2:30 pm. Why should kids have all the fun? Celebrate and enjoy Adult Summer Reading! 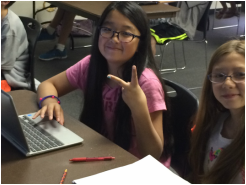 Submit book reviews, attend book discussions and special programs including a visit with author Ellen Meister.